I would like to tell you a true story that I think you will enjoy. Some time ago Captain Kent Gibbens and I had a double charter for a group of 4 anglers. We each had 2 fishermen in our boat and head off for another day of sight fishing in the Merritt Island National Wildlife Refuges Mosquito and Indian River lagoons. Captain Kent took his angler up on the western flats behind the clinkers and I headed east to the pole only section of the lagoon. 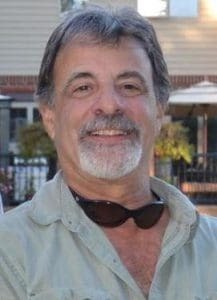 We both decided to meet up at Marker 26 after a couple of hours so our group could get back together and Captain Kent and I could compare notes. When we were finished comparing notes and razzing each other we decided to head to the southern section of the lagoon to an area the locals refer to as the whale tail. This is a big bar with deep water surrounding the majority of it and it usually holds a resident school of large redfish. We pointed our skiffs south and headed south on a pretty breezy morning with me following Captain Kent a few boat lengths behind, cruising between his wake as he cut through the chop. I turned my head for a second to get a glimpse of something that caught my eye, only to turn back and spot Captain Kent’s push pole flying in the air only to land horizontally across my skiffs bow. I immediately pulled back the throttle from a swift plane only to coast squarely over his fiberglass push pole and cut it in half with my lower unit. Now that was one of those crazy things that you would never anticipate to happen, but happen it did. Captain Kent was glad nobody got hurt and said don’t worry about it since he had another new graphite push pole in his garage that he wanted to start using anyway. I still feel bad about the incident to this day even though it’s one of those stories that bring about a good chuckle over some wings and a few beers. The reason I bring up this story is that this was back in the late eighties to early nineties when there were only one or two companies that you could purchase gunnel mounted push pole holders. As time passed enough stories and complaints emerged from flats fisherman about their push poles jumping out of their holders in choppy and rough seas. 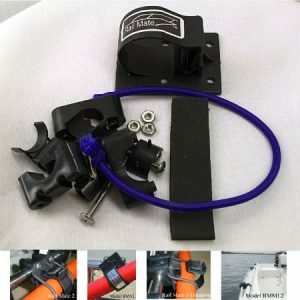 The advent of different types of mounted push pole holders emerged with models that accommodated a bungee cord to hold the push pole in place and other designs to alleviate or eliminate the problem for flats skiffs. The popularity of flats fishing has been growing and more and more fisherman were starting to carry a push on their boats. Larger bay boats started to appear, certain Boston Whaler, Pathfinder and Key West models to name a few, were designed with stainless steel rails mounted around their bows. In these types of boats, the standard type push pole holders that were mounted on the flat gunnels of a flats skiff would not work. Boaters who wanted to carry a push pole for whatever reason, would stow them with a piece of rope or tie it in with a towel or fishing line. When I saw this problem I decided to investigate and research a possible solution. Clamping a holder to the rails of these type boats was the answer I was looking for and The RailMate system was added to my problem-solving products. A set of three RailMates on boats that are 20 to 22 feet long work great. The push pole is placed in the Railmate which completely encircles the pole and an additional bungee cord that is included, is looped over the holder to ensure that it will not jump out. All stainless steel hardware is included and once again the common and potentially dangerous and expensive problem of securing a push pole from bouncing out of these types of fishing craft has been addressed. 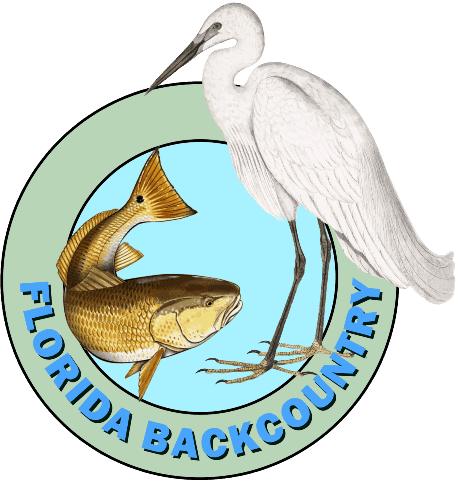 As we proclaim in our mission statement…..
Florida Backcountry is in the business of "providing simple solutions to obvious problems that the shallow water, flats fishing angler encounters."